Insect has appeared since 2010 as a possible substitute for classical feed ingredients as soy and fish meal. There have been huge research and development programs worldwide to bring this production to an interesting industrial yield. Insect represents a sustainable future for the feed industry. Indeed, the ingredients which are today used in the feed could be out of the natural diet for animal (for example fish meal is not entering in the natural diet of poultry). A lot of animals are eating insects naturally, as poultry or fish. Cycle Farms targets mainly the sector in which insect are part of natural diet. It also helps to get the better FCR for animals, and also possible improvement on health and well-being. Insect showed interesting results in nutritional analysis. The profile is comparable with the fish meal, one of the raw material with the highest protein content. In the Cycle Farms case, the protein content for our insect meal is between 55% and 60%. The company chose to limit production cost on this raw material in order to make it benefit to the majority. Insect production could be set up worldwide. 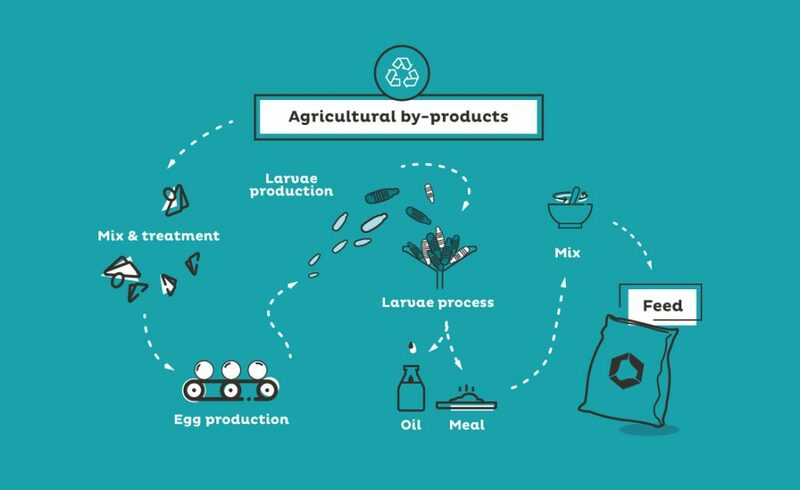 It is mainly linked to the correlation of different parameters: biowaste availability, market for feed or ingredient, biodiversity allowing the use of insect species… This technology enhances the protein production in very isolated space and can be very useful for the local economy and agricultural development.